The seven (Keith Tiana, Alison, John, Alec, Paul and Neil) of us assembled in Dunblane, having caught various trains from Edinburgh / Glasgow. In usual MV style the café was the first port of call – a good coffee before our climb over Sheriff Muir in bright sunshine. Crossing the A9 at Blackford (the days riskiest / busiest road), we avoided a café stop at Gleneagles, instead picnicking at Auchterader. There is some excellent and varied food shopping here, including an ANZAC deli. Zigzagging via Kinkell Bridge, Findo Gask , a roman road with lookouts and Pitcairngreen (unusually for Scotland, this has a superb village green) we joined the cycle route to Dunkeld. Almost forgot, we stopped at another café / deli – the farm shop at Gloagburn! The main feature of the evening – folk music at the Taybank – was unfortunately not on. (we had been assured several weeks before of live folk music) Iona joined us for the evening. The rest of us retraced our route to Pitcairngreen on Sunday, with the inevitable diversion to Gloagburn, and then continued on the cycle path to Perth where Iona, Paul and Alison left us. 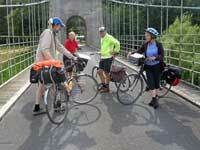 Keith, Alec and Tiana continued via Glenfoot and Strathmiglo to Markinch station. A literal footnote was spotting two moles nosing around in the grass where we had stopped for a short refuelling break. Alec has his foot next to the entrance to their tunnel. One simply followed the ‘correct’ path – over the top of his shoe! It was later suggested that young moles are pushed out of the parental tunnels in Autumn and have to find their own way in the (under) world. 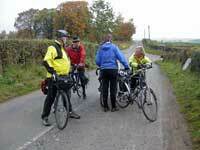 Four of us met in bright sunshine at Fairmilehead Crossroads for this ride. We headed south past Hillend to Easter Bush, taking the new cycleway (incomplete, but partly in use) beside the road past the animal hospitals. Then across the A701, and down to Auchendinny from where we took the railway path to Penicuik. Coffee at Penicuik at a French bistro/patisserie in the main square. Lovely cakes, and filled baguettes, cheaper as carry-out - tempting... That and the weather persuaded us to have a picnic lunch, rather than a pub lunch at West Linton, so we could even out the distances between tea stops. Up the hill out of Penicuik and across Auchencorth Moss, usually a struggle into the wind, but this time the wind was kind to us. A quick look at West Linton, then to avoid the A702 we went round by Mountain Cross and Blyth Bridge, where we picnicked in a wood by a stream. At Blyth Bridge there is an interesting conical war memorial, listing not only the names of the fallen, but also where and when they died, their ages, and their regiments. One was from the Army Cyclists Corps. Along a pretty road to Dolphinton, then into South Lanarkshire. The minor roads there are awful: patched and patched again - maybe good for traffic calming, but very uncomfortable on a bike, especially downhill. Finally, down, down to New Lanark. There are two signposted routes: one for cars (ending at the car park above the village) and one for pedestrians (steep paths with steps). There is a third route, not well signed, for residents: that is the best one for bikes. Saturday's total: about 45 miles. 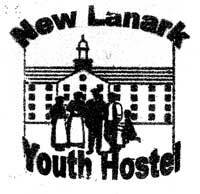 Overnight at New Lanark Youth Hostel: comfortable and friendly. Sunday: not so sunny, but still pleasantly warm. Before the hostel closed we had time to walk up river to Corra Linn, one of the main Falls of Clyde; later we looked round New Lanark (a World Heritage Site) until mid-morning. If it wasn't for the cars it must look much as it did in 1800. We left Lanark by Mousebank, including a precipitous drop into, and walk out of, the Mouse Water gorge: hard work, but worth it for the scenery. Some Highland cattle met us at the top of the far bank. We negotiated the busy junction of the A721 and A706 before turning off north-eastwards: that was the last A road of the day, apart from one flat crossing (described later). A very good lunch at the Last Shift Inn at Braehead. On through Auchengray to the summit at Pearie Law, then a fast run down by Harwood and an SWT wildlife reserve to the edge of Livingston. Here we entered a maze of footpaths that allowed us to cross all the main roads by bridges or underpasses, and emerged triumphantly in Midcalder. (Thanks to the Spokes West Lothian Map makers.) We celebrated the successful navigation with drinks at the Black Bull. After East Calder we joined NCN 75, which crosses the A71 at traffic lights with a cycle phase, and continued through Kirknewton and along Long Dalmahoy Road. Rather than follow 75 up a very steep hill to Balerno we continued eastwards, through Heriot-Watt and the level crossing at Whitelaw (our third crossing on the level of the Carstairs-Edinburgh railway, each one in the same direction), to Westburn where we joined the canal towpath into Edinburgh. Sunday's total: about 42 miles. Less than one mile was on A roads and only two miles on B; the rest was on minor roads or paths. Nobody in the group had a camera, so Tiana looked out a photo. Saturday By train or car, we (total 8) met at Berwick Station well before 10 a.m. One person had discovered she needed a new tyre so she had headed off to the bike shop on Bridge Street. 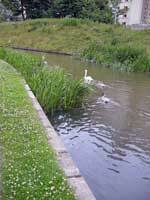 We joined her there and were soon heading south along NCN 1. The sun was shining as forecast. The track was narrow, some parts not ideal for average/narrow tyres. Rather than go inland to Cheswick, we headed for Goswick Sands. In great spirits, we crossed the Causeway at a brisk pace and arrived at Lindisfarne by 12 noon. The island was very busy but we were able to see the Castle and Priory and get lunch. We left at 1.30. We had discussed asking the hostel warden for dinner but it was too short notice and we guessed we might arrive too late anyway. Returning via Beal, (NCN 1), we headed to Fenwick and Detchant, turning left before Belford, to arrive in Bamburgh at 3.30. 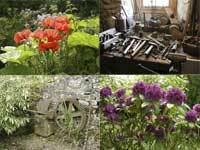 Almost everyone succumbed to a cream tea/apple cake/toasted tea cake and/or local ginger beer at The Copper Kettle. We bought necessary groceries in the shop ‘in the wall’ and set off south again on NCN 1. No-one chose the shortcut west. Skirting Seahouses, going via Chathill and turning right for Preston (thanks Tiana), we arrived at North Charlton (to cross the A1). Sunday . We woke to a fine drizzle. We were all aware that the weather forecast was poor but, in fact, it rained for an hour in the morning and a little in the afternoon. Otherwise, sunshine and clouds. The plan was to leave at 9.15, but two people slept in! This proved fortuitous as, taking NCN 68, we arrived in Doddington just as the (promised) ice-creams arrived. (They’re in a freezer with an honesty box alongside). Our two guests from the Borders left us for the direct route to Berwick. 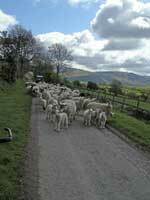 Continuing on NCN 68 to Fenton, Kimmerston and Ford, we arrived just as the Heatherslaw Mill café was opening. 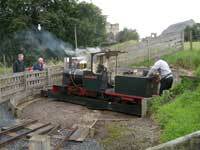 During coffee, four of us decided to go on the mini-steam train to Etal, the return journey taking an hour. This proved a great success – very interesting and a pleasant rest. 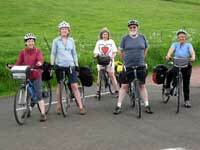 The other two in the party decided to cycle to Coldstream and would meet us in Norham. 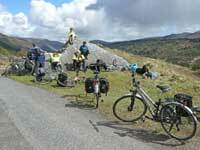 From Etal, we took NCN 68 alongside the river but the route was totally unsuitable for all but mountain bikes. Fiona found a track which took us back to the unclassified road and onto Duddo Hill and Norham. After a break for snacks and a look at the old Norham station, we set off up to the castle and on via Horncliffe to the Chain Bridge Honey Farm. We enjoyed the displays, the shop, the vintage vehicles and the café (in a bus) then set off across the Chain Bridge (built 1820) into Scotland, heading for Berwick. We joined the B6461 and passing Paxton House, arrived in Berwick at 6 p.m. - amply in time for our trains home. Six + one day tripper met up at Carmichael Mill. What a wonderful place! What a treat you all missed. The mill, last used in 1957, has all its machinery, and was not the family's living room now in the hopper room it could still grind grain. As it was, the sluice gate was opened to give the wheel a wee spin and haul a sample bag of grain up to the hopper floor. The machine room looked as if the workmen had just left for lunch..
We could see some of the excavations that revealed that the site was an iron foundry for some 300 years and that there had been mills of one description or another there for 800 years or more. The gardens were a blaze of colour - a huge variety of plants on a mixture of soils from sodden to dry, but rich with the alluvium brought by regular flooding. We expected coffee and cake for our refreshments but we emerged stuffed with homemade asparagus quiche and strawberry flan to embark on our scenic ride to the highest village in Scotland. We cycled through light showers - we missed the whopper while in the mill - enjoying the countryside through Carmichael village then alongside the Douglas Water, then turning onto the old A74 (now NCN74) to Crawfordjohn where we stopped for a drink. No wimp took the shortcut and we all enjoyed the beautiful run down the Crawick Valley to Sanquhar where the sun shone brightly upon us. 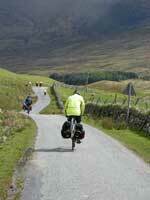 Then to Mennock and up the Mennock pass to Wanlockhead. Those that had professed to be unsure as to whether they could manage it, surged up the hill way in front of the group to be found sitting calmly drinking beer at the hotel looking as if they'd been there half an hour! The distance was shorter than anticipated at 42 miles. 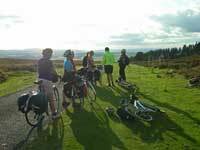 Sunday was bright and sunny as we set off towards Abington. We avoided the steep climb via Crawfordjohn preferring to stick to the valley route and join the NCN74 once more for a short while before zigzagging northwards to Biggar where we stopped for coffee. John left us here to take the road back westward and home. The rest of us took another break at Broughton to see the John Buchan centre / gardens / cafe before setting off to Dreva fort on the North bank of the Tweed. 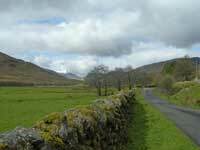 We declined to walk to the fort itself but continued along the valley to meet the road across the Meldons. We had grand views here too and just as well we appreciated them because at Eddleston we hit the rain - oooh and what rain! It reminded Barbara Jenny and me of the monsoon we met on the Moorfoots - difference this time was that we were trying to cycle on a main road. The first shelter was the bus stop at Leadburn where we stayed until Paul insisted we went back in his car. So it was a slightly shorter but still respectable 50 miles. We rendezvoused at Grandtully – Tiana, Barbara, Paul, Colette, Judith, Roz, Richard, Gillian and myself – at the nice coffee shop (of course! ),called “Legends”, for pre-departure sustenance! Then we set off along the bridge over the Grandtully rapids and canoe slalom course, and up the first wee sharp hill to the Strathtay Road! We breezed along by the river, thro’ Weem, past The House of Menzies (too early for another coffee break! ), and then a L turn down to Kenmore for lunch. I knew the Croft’na’Caber café by the Crannog was closed, but was surprised to find the “old church” café in Kenmore was also shut! Suitably replenished, we continued along the quiet south Loch Tay road, with lovely views over the loch, ‘til reaching the quaint Ardeonaig Hotel, where we had often stopped on previous trips for tea and coffee. Much to our incredulous amazement, after the nine of us had ordered tea and coffee (but only one scone apparently!! ), the “manager” appeared and “announced” we hadn’t ordered scones! and indeed “the scones had been made”!! She stood aside as we all filed out; when it became apparent she was not best pleased with our order!!! I must say I was very disappointed with this incident, as I had previously stayed there, and it is a lovely small hotel! Let’s hope this brand of hospitality to cyclists is not catching!! On reaching Killin, 3 departed to their B&B, while the other 6 of us toiled our way slowly uphill on the north Loch Tay road out of Killin, to what proved to be a wonderful B&B destination at Kiltyrie Farmhouse. Our hostess, not only greeted us with free home baking, tea and coffee, but also provided us with a fantastic evening meal at a moderate cost. It was a very relaxing evening sitting in her conservatory in the shadow of Ben Lawers, with views to mountains and loch, watching the 4 hens with operatic names scratching happily round the garden!! On Sunday we had a tasty breakfast, with any preference catered for – mine being pancake, bacon and maple syrup!! The home baking was produced again, with some small plastic bags, and we were urged to take some “for the road”!! The contrast between her hospitality and yesterdays experience defies comparison! The “Kiltyrie 6” zoomed back down the hill to the bridge rendezvous point with the “Killin 3”, and we set off up pretty Glen Lochay, to the turn-off to the steep hairpin bend section up, over and down to the head of Glen Lyon. At last I heard my first Spring cuckoos in Glen Lochay and Glen Lyon! Colette had to rescue a panicked lamb who tried to strangle itself in the deer fence - but was happily reunited with its mother, after a delicate manipulation to extricate it from its predicament! The sun shone on us, as we sailed down Glen Lyon to Bridge of Balgie Post Office Tearoom for lunch - another hospitable and scenic stop, popular with cyclists and a good spot for red squirrel spotting! In the late afternoon sunshine, we carried on back thro’ Weem and Strathtay to Grandtully, and farewells, before heading home after an enjoyable weekend! Two days in Cumbria at the beginning of May cycling the Solway coastline and looping back north of the Lake District sounded like a wonderful idea in January. Duly put into the MV programme, and the Youth Hostel in Cockermouth booked, Railtrack almost scuppered the plan. For reasons unknown even to railway staff, there is no train connecting Edinburgh with Lockerbie (hence Carlisle) for three months. So an assortment of travel plans were made, only two of which came unstuck! Saturday 2nd May saw five of us converging on the Solway coast: Sue, Alec and Sheelagh came by car (Sheelagh having to drive herself at the last moment) to Burgh-by-Sands, meeting Keith and Tiana in Angerton, where the only food served by the one pub was crisps. So on down the Cumbrian coast to Silloth, following route 71, in search of lunch. Silloth turns out to be a clean and spacious seaside town with many chippies and no cafes which were open (on the Saturday of a holiday weekend). As the weather was sunny we checke d out the Spar and congregated on the town park to eat a picnic. We continued down the coast, cycling into a strong south-westerly, with wonderful views of southern Scotland (Cumbria must be the only place in England where by looking at Scotland across an expanse of water you can see it as a distinct country). We turned inland just south of Allonby (very pretty) and duly arrived at Cockermouth Youth Hostel. This turns out to be an old watermill on the riverside and accessible down an unsurfaced track. It's quite difficult to find, but well worth it. Sunday was hillier, cooler and a bit cloudier with the odd rain shower (not to mention downpour, but fortunately we missed the worst). We took local cycle route 10 towards Priests' Mill but stopped in the neighbouring village at a Quaker-run refreshment point with wonderful home baking. The main excitement of the day came when t hree of us, pushing our bikes up a steep hill, acquired a follower in the form of a small white terrier by the name of Ritza, who was desperate for company and attention. She determinedly followed us for over two miles, even finding a way over a cattle grid, until we could get back on the bikes and cycle off leaving her whining in our wake! Fortunately, Keith and Tiana eventually managed to get hold of her owners who told them that Ritza is partial to making new friends in this way. Our paths diverged after Priests Mill, with Sheelagh stopping off to have coffee with her sister, Keith and Tiana continuing on a marathon to Once Brewed YH, and Sue and Alec heading in a roundabout way back to Burgh-by-Sands, meeting up with Sheelagh there before heading home. Altogether an enjoyable and amusing weekend, despite the travel disasters and the desperate dog. 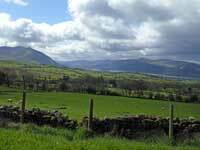 This part of Cumbria is much to be recommended, and the main suggestion is to pick a weekend when it's not blowing such a wind, so you get a chance to stop and look at some of the places you pass." Once again Mellow Velo attracted the best weather in the area. 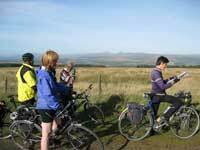 Seven folk set off from the first café stop of the day in Musselburgh to go exploring the paths of East Lothian. We started with the lovely River Esk path. The two who chose to take the later train meant to meet us there but took a wrong turning - best to get it over and done with – but caught us up by lunch. The Elphinstone – West Saltoun path has recently been repaired. It was in a terrible state and now it’s great – no puddles, swamps or subsidence holes. There are even seats and a picnic table, new signboards and old train gates at some of the exit points. We enjoyed an excellent lunch at the restaurant in the Goblin Ha’ hotel in Gifford. The trip back took a more northerly route taking in the old bridge at Samuelston, a photo stop for the alpacas and negotiating the not so muddy track at Penston farm. This encouraged us the tackle the next track along. This brought us to Falside castle. 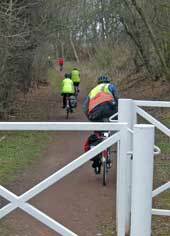 There is a steep hill down to the main road where there is a cycle path to Inveresk.